I had a really bad week. A friend passed away, I had to leave my beloved job, and to top it all off, I noticed that my cat’s Alzheimer’s is progressing at an alarming rate (yes, cats can get Alzheimer’s too). My emotions ran the gamut this week, but they were mostly unpleasant. The only high was when my boss threw an end-of-the-year celebration where, admittedly, I “overindulged”, just short of parading around with a lampshade on my head. When the body undergoes any kind of stress, whether it is physical or emotional, the first vitamin in your body to take the hit, are the B vitamins. Also referred to as the “B complex”, this collective of essential nutrients act as the catalytic spark plugs of the body, needed in every step along the path of food converting to energy. In other words, without them, you’re about as lively as a bag of bricks (which would accurately describe how I felt this morning). Each have their own specific and crucial roles within our bodies, but they function quite well as a group, and often appear together in our foods in the proportions that we need. That is why taking a supplement (which is what I am about to suggest), is less advisable than eating a balanced diet, since they are abundant in whole foods. But, desperate times call for desperate measures. I have been taking a “stress formula” all week long, just to support my precious little temple of a body until the storm passes. That means, in addition to my healthy diet, I have been taking 50 mg of a B complex with my breakfast. This is a rather safe does for any adult, but you can begin with less and see how you feel. I have friends that notice a great difference with 25 mg and others who go above and beyond. B vitamins are water soluble, which means that you will excrete anything your body does not use in your urine, so there is little risk of overdosing. And on the topic of urine, please be advised that yours will turn neon green or yellow when you take B vitamins, or any good multivitamin containing them. Don’t be alarmed, this is just the extra that your body doesn’t need. 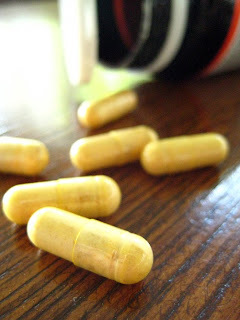 Before taking any supplement, absolutely consult an experienced sales associate at your local health food store first. There are inconclusive studies that have been done about B vitamins and stress, but I have seen positive results in myself and that’s all the proof I need. I also take a B complex during my world adventures to help my body cope with the stresses of traveling, and to give me more energy, which helps tremendously with jet lag. I even know people who have given up coffee thanks to these little capsules of vigor. A miracle? No. Where else can I get B vitamins? The B vitamins are abundant in whole foods, but the best sources are whole grains! Ever read the ingredient list on a bag of Wonderbread? If you see the term “enriched” on something, a list of the B vitamins will typically follow, as when grains are refined, they lose all their nutrition and namely, their B vitamins. Manufacturers add them back in after processing, but it is all in vain. Don’t eat Wonderbread. Eat quinoa instead. B vitamins are also present in (surprise!) fruits and vegetables. The best way to avoid a hangover is not drinking at all. Sorry, I’m a nutritionist – I have to say that. Before you go to bed (if you can remember) take a 50 mg dose of a good B complex vitamin with as much water as you can handle. There are several reasons we feel so crummy the day after, but most of them have to do with being dehydrated, and the fact that while you’re sleeping, your cells are frantically metabolizing the alcohol that they’re drowning in. Acetaldehyde is a by-product of metabolizing alcohol. Acetaldehyde induces a deficiency of vitamin B1. Thiamin, or Vitamin B1, is so critical to brain and nerve function it is often called the nerve vitamin. The reason you should take a B complex is that, as a collective, they will give you the energy to make it to brunch with your folks. Hey, at least they’re paying. Thanks for your article. I would love to opinion that the very first thing you will need to carry out is determine if you really need credit restoration. To do that you must get your hands on a replica of your credit report. That should not be difficult, ever since the government mandates that you are allowed to acquire one free of charge copy of your real credit report yearly. You just have to ask the right persons. You can either look into the website owned by the Federal Trade Commission or even contact one of the main credit agencies specifically. This, in my mind is an excellent explanation on how a learned Muslim looks at the “Allah” issue. What is the “Allah” issue? Thanks a lot for one more great write-up. Where else can anyone obtain this type of data in that fantastic means of writing? I’ve some sort of demonstration sunday, and I’m looking for good tips similar to this. I use Johnson Creek as well in my pen style NJOY and after trying a few other companies who sell juice Johnson creek is still my favorite. Sources such as the 1 you mentioned right here will be extremely helpful to myself! An newsworthy treatment is designer note. I expect that you should indite author on this theme, it mightiness not be a sacred substance but generally grouping are not enough to speak on much topics. To the succeeding. Cheers like your Penyebab Bunyi Berdecit Pada Tali Kipas Mobil | Trisangga Raya Rent Car. Hi there! This post couldn’t be written much better! Going through this post reminds me of my previous roommate! He always kept talking about this. I most certainly will send this post to him. Pretty sure he’ll have a good read. Many thanks for sharing! After checking out a number of the articles on your web page, I honestly appreciate your technique of writing a blog. I saved as a favorite it to my bookmark webpage list and will be checking back in the near future. Please check out my web site as well and tell me how you feel. Everything is very open with a very clear clarification of the challenges. It was truly informative. Your website is very helpful. Many thanks for sharing! Hello there! I could have sworn I’ve been to your blog before but after browsing through some of the articles I realized it’s new to me. Nonetheless, I’m definitely pleased I discovered it and I’ll be bookmarking it and checking back frequently! Nok and company run the very best hostel in Chiang Mai. Not only do they use a wonderfully friendly and trusting atmosphere (drink and spend later) but they will get drunk with you every time and I dare you to out-drink Nok. It cant be accomplished five stars in my reserve. Take pleasure in. What are your thoughts on taking a Vit B complex supplement to help with thyroid function when under stress? That is a great idea, Julia. Go for it. just had some rainy days myself. wish we are a bit closer. come to startford soon pls, darling.